PT Pembangunan Perumahan (Persero) Tbk - PTPP or referred to as "PT PP (Persero) Tbk" is a reputable and long standing state-owned construction company in Indonesia. PT PP (Persero) Tbk was formed in 1953 and has strong reputation in Indonesia for more than 60 years in construction of prestigious building, infrastructure, property and Engineering, Procurement and Construction (EPC). PT PP (Persero) Tbk is a public listed company with majority share holder by the Government of Indonesia. At present, 51% of its shares are held by the Government of Indonesia, 4.01% by PT PP Employees Shareholders Cooperative (KKPSPP), and 44.99% remaining shares by investor and public shareholders. PT PP (Persero) Tbk is based in Jakarta and now has 5 key subsidiary companies; PT PP Dirganeka (99.999% owned by PTPP), PT PP Pracetak (99.999%), PT Gitanusa Sarana Niaga (99.99%), PT PP Alkon (99.98%), and PT PP Properti Tbk (99.9%). PT PP (Persero) Tbk reached significant performance in 2015. PT PP (Persero) Tbk booked total operating revenue of Rp 14,217.37 billion in 2015 or an increase of 14.40% year-on-year (yoy) from Rp 12,427.37 billion in 2014. Total comprehensive income in 2015 amounted to Rp 845.56 billion. These total comprehensive profit figures equivalent with a 58.49% growth as compared with Rp 533.52 in 2014, according to PT Pembangunan Perumahan (Persero) Tbk - Financial Highlight 2015 as quoted by JobsCDC.com. Male / Female with a maximum age of 26 years old. Minimum Background in Bachelor Degree (S1) of Civil Engineering from reputable university with GPA ≥ 3.00. Strong computer skill, especially in using of IT application/progam that related with civil/construction. Actively involved in campus organization activities is an advantage. Minimum Background in Bachelor Degree (S1) of Electrical Engineering (Strong Current) from reputable university with GPA ≥ 3.00. Strong understanding about the principles of electrical engineering, electrical work building, procedures of procurement and implementations electrical functions in the project. Deeply interesting and have good knowledge in the field of EPC. Minimum Background in Bachelor Degree (S1) of Psyhics Engineering and Electrical Engineering (Control and Telecomunications) from reputable university with GPA ≥ 3.00. Minimum Background in Bachelor Degree (S1) of Mechanical Engineering from reputable university with GPA ≥ 3.00. JobsCDC.com now available on android device. Download now on Google Play here. Please be aware of recruitment fraud. The entire stage of this selection process is free of charge. 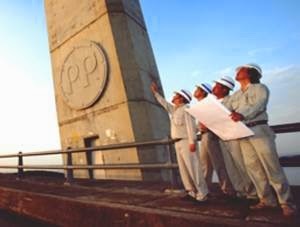 PT PP (Persero) Tbk - Fresh Graduate Management Trainee Program PTPP June 2016 will never ask for fees or upfront payments for any purposes during the recruitment process such as transportation and accommodation.